On my recent trips upto Yorkshire, Carnaby Airfield was one site I visited. Some more posts from Yorkshire to follow as well as some posts on the Corps Line in Suffolk.
" Carnaby opened in March 1944 as an emergency landing ground for Bomber Command to enable crippled bombers a safe place to land near the coast. Carnaby Moor, near Bridlington was ideal. A single runway almost 2 miles long and over 700ft wide was constructed. The airfield had to be available in any weather and as well as an anti skid bitumen surface for the runway, FIDO (Fog Investigation Dispersal Operation), a device of petrol burners used to burn off fog, was installed. The system used lighted petrol to lift the fog from the airfield thus enabling aircraft to land safely. Carnaby's wartime service was short but in it's operational life over 1400 emergency landings were recorded. The base closed in March 1946 and was left to the elements until the outbreak of the Korean War, where the RAF increased its pilot training programme and Carnaby opened again in 1953 becoming a relief landing ground for Driffield. Again, life to Carnaby was short lived and the base closed in 1954. 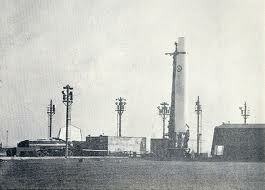 It wasn't until 1958 that Carnaby became operational again, this time deemed as a Thor missile site. 150 squadron was reformed and designated the Thor unit. 1963 saw the base close for the last time and the site was left to decay. In 1972 the site was brought by Bridlington Council and was turned into an industrial estate, as it is today. The main runway is now the road through the estate, the only real clue to its existence as an airfield. Very little remains today but you can still see parts of the taxiways. " Above: Carnaby Industrial Estate on the site of Carnaby Airfield. FIDO consisted of injecting petrol through pressurised pipes either side of the runway, which was then fired by burners set at certain intervals along the pipeline. It was estimated that visibility could be increased by 200 to 2,000 feet. Only three emergency airfields were constructed during the War, all equipped with FIDO (Woodbridge in Suffolk was also an emergency runway). FIDO was also installed at 12 other airfields which included Tuddenham in Suffolk. FIDO was utilised on several occasions at Carnaby, which resulted in rumours in local villages that the runways had caught fire! During Dec 1944 about 100 American Fortresses landed and parked up in a double row alongside the airfield, unable to land at their East Anglian airfields due to fog. They all took off safely the following day. 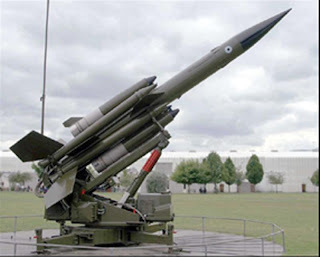 My mother remembers seeing missiles pointing out to sea while travelling to work on the train from Bridlington to Beverley. As Thor's were stored horizontally on transporter-erector trailers under cover of a retractable missile shelter I assume these must have been Bloodhound surface to air missiles sited to protect the Thor's - one major weakness of Thor was the launch sequence took 15 minutes making them vulnerable to attack before they could be launched. On my visit I came across three remaining buildings although I don't know from which part of the airfields history they date from. Some standings/taxiways and remains of manholes/pipes in nearby fields can also be seen. Are the pipes/manholes the remains of FIDO?? Image 1 - 4: Remains of building, presumably a workshop. Image 5 & 6: Remains of second building still surviving. Image 7: Remains of the third building that can still be seen. Image 9 & 10: Pipes/ manholes in nearby fields - remains of FIDO? During my recent visit up to Yorkshire, I visited Atwick. As with much of the Yorkshire coast south of Bridlington, it is eroding fast here, and as with many sites along this stretch of coast, the front line defences have disappeared. The pillboxes surviving today were part of the rear line of defences. It is easy to see why this stretch of coast was heavily defended - as a sketch I came across at TNA shows - the whole beach from Bridlington to Spurn was suitable for landings, the cliffs would have easily been passable to German infantry, with suitable gaps along the coast for tanks. Above: A sketch of the beaches along the Yorkshire Coast (TNA) - the red areas are suitable for landings, the green areas not - and below a view of the beach at Atwick looking north towards Bridlington and Flamborough Head. The surviving pillboxes are all of the Northern Command lozenge design. One which has its entrance sealed has all its wooden weapons-shelves in place. Also surviving in the area are two partially sunken posts, presumably these would be Command Posts (platoon or company HQ's?). They are not identical, one being larger with two rooms, the other smaller with one room only. They are the only ones I've seen along this stretch of coast and I don't know if others exist. They are not shell proof with additional protection given by covering with earth as images 7 and 8 below clearly show. Atwick 'gap' was blocked with anti-tank cubes but the only remains of these now have been heaped up to act as sea defences. Image 1-4: Lozenge pillbox with wooden weapons shelves still intact. Images 7-8: The larger of the sunken posts, with lozenge pillbox in background. Image 9: The pillbox near the second sunken post. Image 10: Remains of tank blocks, Atwick gap, now part of the sea defences.